Fattoush Salad is a Lebanese bread salad - greens, veggies and toasted pita bread pieces are the main ingredients. But, I have never loved bread croutons in my salad and for that reason, I have skipped the toasted pita chips in the fattoush salad I made. The dressing for fattoush salad has two vital ingredients among others - sumac and pomegranate molasses. Sumac is tangy dried powder made from a kind of Middle Eastern red berry. Pomegranate molasses as the name says is made from pomegranate and is a commonly used ingredient in Middle Eastern cooking. I didn't have both these ingredients at hand, so I made the dressing without them. I have read that these two ingredients can make a lot of difference to the salad and I will surely try them whenever I get to buy them. I did search about making pomegranate molasses at home and there were many links that said you could make it by cooking pomegranate juice over a low heat for a long time. But, then I am really wary of cooking fruit juices. So, I dropped the idea and went ahead to make my customised Fattoush Salad. Last month had been an indulgent one for me foodwise. If you have checked my last month's posts, you will notice I posted mostly sweet dishes - brownies, kheer, peda. All that was part of the themes I chose to do for that month's blogging marathon. But, the result is now seen when I stand on the bathroom scale! Such is the life of a food blogger - I want to cook all the delicious dishes in the world, but then I have to take some steps back as ultimately I will be on the receiving end. So, for this month, I decided I would blog about something really healthy. My chosen theme for the first week of BM#79 is Lebanese cuisine. And today I am posting the recipe for Fattoush Salad, albeit a customised one. 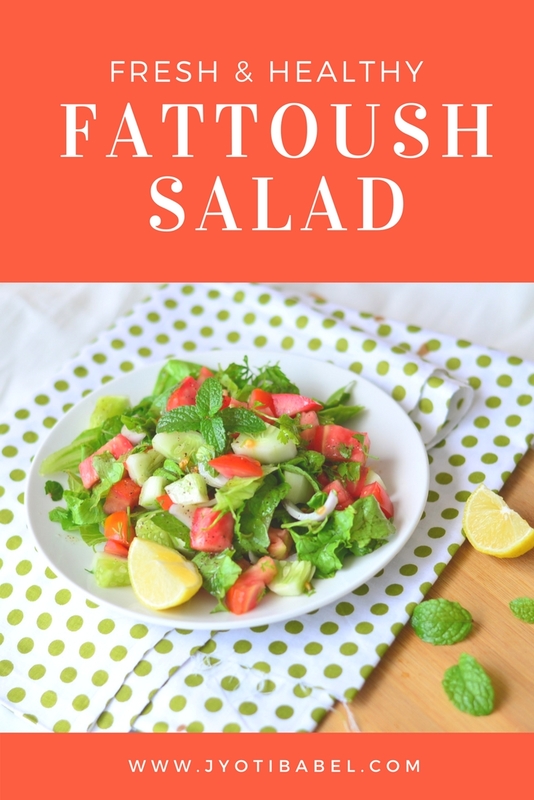 Let's check out how I made my Fattoush Salad. 1. Mix all the ingredients for the salad dressing in a bowl and whisk nicely. 2. Mix all the salad ingredients except toasted pita bread pieces. 3. Right before serving, add the dressing to the salad. Top it with pita chips (if you like) and serve immediately. That is so true, being a blogger is so tough. That is why I try to feed others whatever I make so that I don't have to worry about my weight gain. This is such a great colourful and refreshing salad. Agree with gayatri... being a blogger... everytime we gain lots of weight due to our recipes. Otherwise salad looks awesome healthy meal. I love bread salads but had never had the Fattoush. Learnt something new. Pita bread and vegetables combo sounds great. wow.. 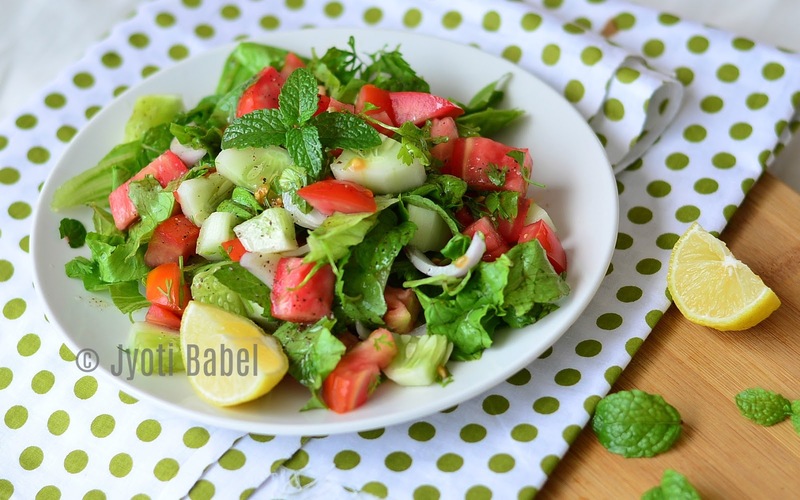 Such a colourful and refreshing salad.. Beautiful Share..
Talk of weight and bloggers ! We have to be on a constant watch , wish God had given us a stomach which would not store and the weight could be maintained 😜 . Your version of Fattoush sounds great . Your version of the salad does look very colourful and inviting..somehow I am not very keen on sweetish taste for a salad, so I will settle for this..:)..and one of the reasons why I mostly take up kids theme is that we don't have to take in all that.heheh..
Love your version of the fattoush salad, simple, crisp, healthy. I second your thoughts about bloggers wanting to make everything whether sinful or healthy. However, I feel by trying out so many different dishes we bring joy and satisfy hunger pangs and fill empty stomaches.